Welcome to the SFW/JDRF Ride to Cure Diabetes Page! For over 10 years, SFW has made cycling an integral part of its culture and identity. From Friday afternoon rides in the park to our grueling Bike to Work Week and Ride to Raleigh, cycling serves as a catalyst for wellness, culture, and teamwork. But this year, we're looking to make a much bigger impact. Diabetes impacts many of those in the SFW family. And there's no better cause in our minds than the JDRF Ride to Cure Diabetes, which combines our passion for cycling with the importance of finding a cure for T1D. 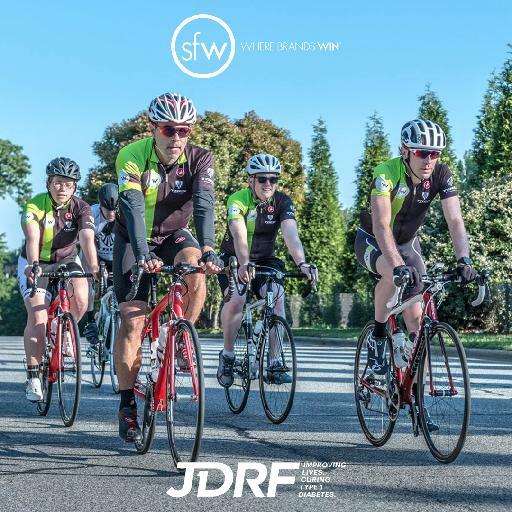 We're taking part in the JDRF Ride to Cure Diabetes because we at SFW are up for a physical and mental challenge that will make a difference. Even new-to-the-sport novices are gearing up for the first time to join in the challenge. We're going all in and we need your help. Every dollar you donate gets the SFW team one step closer to participating in this awesome event AND funds research that can help bring T1D to an end. There is no way to prevent T1D and there is no cure...yet. But SFW and JDRF are working hard to change that. Help us conquer T1D one mile at a time with your donation!